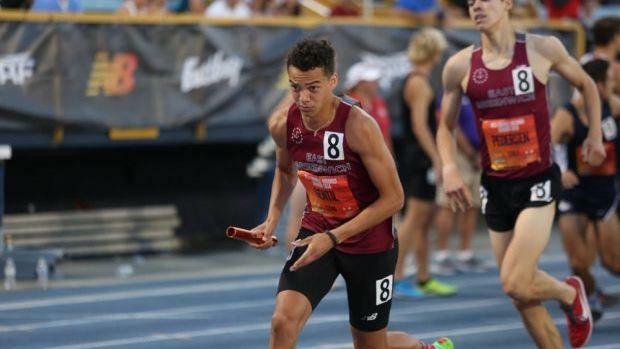 East Greenwich's 4x800-meter relay squad had one thing on their mind before Saturday's Championship Event at the New Balance Nationals Outdoor (NBNO) Championships - a state record! In one of the fastest races in the meet's history, the Avengers accomplished that goal in convincing fashion. One week after winning the New England title, the foursome of Colin Cianciolo, Jeffery Pedersen, Quentin Viera and Cebastian Gentil placed third overall at North Carolina's AT&T Irwin Belk Track with a new R.I. record and nation No. 3 of 7 minutes, 35.43 seconds. Gentil proved to be the perfect anchor for EG with a big-time PR of 1:49.38! All the remaining Avengers clocked impressive 1:55 clockings. East Greenwich erased the 2014 mark of 7:37.62, set by North Kingstown at NBNO. Cow Harbor (NY) won the race with a nation No. 1 of 7:31.62. Finishing second was Western Cary (NC) at 7:32.06 (US #2). St. Benedict Prep (NJ) was also under 7:40, placing fourth with a time of 7:35.87.